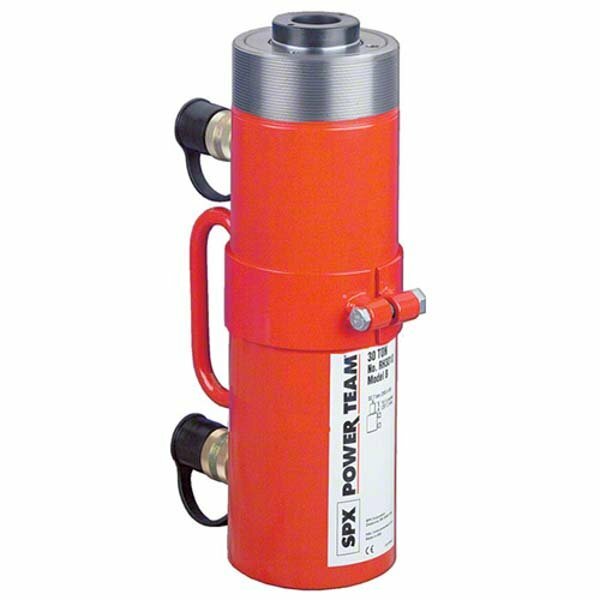 These 30 to 200 Ton double acting centre hole cylinders are ideal for pulling and tensioning of cables, anchor bolts, forcing screws, etc. Interchangeable inserts for the piston head enable use for a variety of applications. Intrinsic safety device rules out the retract circuit becoming over-pressurized. Standpipe fights corrosion courtesy of “Power Tech” coating. High cycle life, no leaks, thanks to superior packings. Piston rod plating prevents wear. Cylinders come with 3/8” NPTF half couplers (part no. 9796). 60 ton to 200 ton cylinders come with removable carry handles as standard. * Supplied with carrying handles. ** Measured with 19 mm high serrated insert installed.